Still shaken from the deadly attack on an Orlando, Florida nightclub less than two weeks ago, members of the local gay community and allies gathered at the Church of the Epiphany in Lincoln Heights last Saturday to honor the victims and offer support to those still grieving. At around 2 a.m. on June 12, Omar Mateen, 29, walked into Pulse, a nightclub popular with the gay community. Armed with a semiautomatic rifle, he started shooting. For three hours he barricaded himself in a restroom, holding 30 people hostage, before being shot and killed by SWAT police. When it was all over, 49 people were dead and 53 more were injured. One by one, Saturday, the names of the victims was read aloud, followed by a moment of silence. Bells at the historic church tolled 49 times, once for each of the murder victims. “It was very emotional,” 27-year-old Andres Magana told EGP. “But we also had a lot of support from the community,” he said following the “Raise Our Pride” event. Planned before the Orlando shooting, Raise Our Pride was originally intended to provide information about HIV in Los Angeles, including statistics and resources for prevention, according to Richard Zaldivar, founder of The-Wall Las Memorias Project, a community health and wellness organization that serves the Latino, LGBTQ and underserved communities. In the wake of the mass shooting, however, organizers felt there was a need to show solidarity with the Lesbian/Gay/Bisexual/Transgender/Queer (LGBTQ) community mourning all over the world, Zaldivar told EGP. 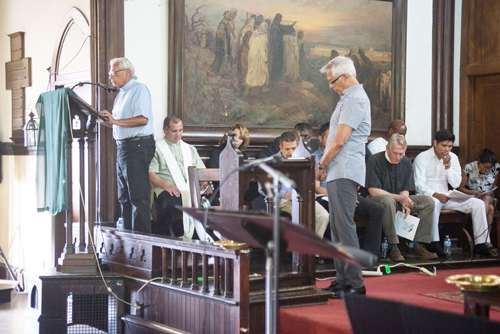 Clergy from a number of Christian churches, members of the Islamic Center of Southern California, actor Johnny Ortiz, LAPD Senior Lead Officer Ian Lewis, L.A. City Controller Ron Galperin and UFCW Local 770 Vice President Rigo Valdez joined in prayer for the victims. 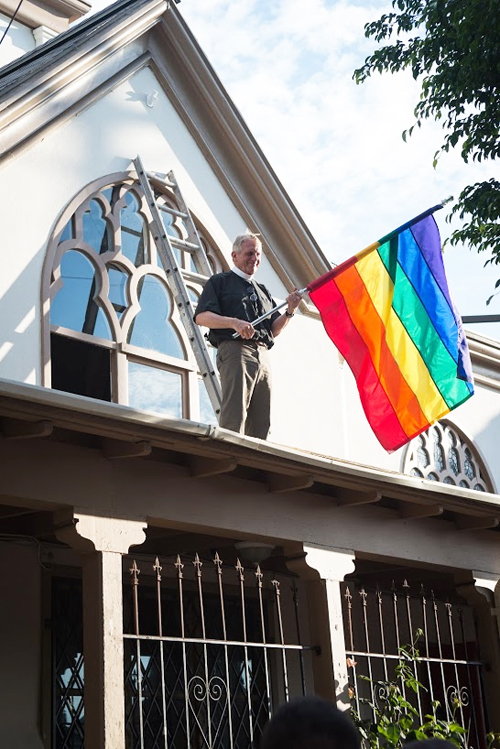 As nearly 200 people in unison chanted “we are not afraid” outside the Church of the Epiphany, the rainbow flag symbolic with gay pride and the diversity of LGBTQ community was raised for the first time ever above the 120-year-old Episcopal church on Altura Street. Church of the Epiphany Vicar Thomas Carey identifies as a gay man and he told EGP that the church has a long history of supporting the Chicano movement and immigrant and LGBTQ rights. The community of Lincoln Heights is more open and the church welcomes everybody to pray, he said, adding they make no distinction between people who are gay or heterosexual. Magana, also gay, works for the The Wall Las Memorias and told EGP he vividly remembers waking up to the news of the Orlando shooting. “I just looked and looked at the news for hours before I took time to step back and react,” he recalled, explaining that’s when he started to reach out to other members of the nonprofit to try to come up with a strategy to help staff and their clients deal with the tragedy. The attack on the gay community was especially shocking because it happened at a place “where our community goes to be themselves … and the fact that it happened inside a gay club is really sad,” he said. The attack at Pulse is considered the deadliest mass shooting by a single gunman and the deadliest attack against the gay community in U.S. history. Many media outlets and law enforcement agencies have labeled it as both a terrorist attack and a hate crime against the LGBTQ community. The gay community is not going into hiding, Zaldivar family told EGP. “We are saying that we have to be vigilant wherever we are, but we can’t stop being who we are,” he said. “I don’t know why it happens,” but people often misquote ambiguous parts of the Bible when they show hate for the LGBTQ community, Carey told EGP, calling it arrogant for people to think they “know the word of God” and to act out in this way. “There are parts [in the Bible] where it says to kill every men and child, and do we do it?” he asked. The-Wall Las Memorias and the Church of the Epiphany are serving as spaces where members of the LGBTQ community can talk about their feeling either one on one with a member of the clergy or in peer groups. The LGBTQ community needs time to be sad and mourn, and to let those emotions come out, says Magana. “But at the same time, once we are able to bring those emotions out, to do some sort of action, whether that’s locally, statewide, nationally or even in smaller networks, like with friends and families,” he told EGP. We need to pressure Congress to pass stronger gun control laws, said Zaldivar, who told EGP he was invited by Congressman Xavier Becerra to attend the LBGTQ Caucus meeting today in Sacramento to discuss actions to prevent similar attacks. The rainbow flag still flies above the Lincoln Heights area church and according to Father Carey, they’ve not received any negative response. For more information about The-Wall Las Memorias and its services, visit www.thewalllasmemorias.org. For more information about the Church of the Epiphany, visit http://epiphany.ladiocese.org/ or call Vicar Carey at (323) 227-9931. 4th Wednesday of every month at 7:30pm. 5619 Monte Vista Street 90042. The Leadership Circle: Last Wednesday of the month at 6pm. Meets in various locations in Boyle Heights. Call the office for more details (323) 257-1056.